The 2016 Chevy Cruze is on sale, and it’s all new. The previous Cruze model from 2016 is now being labeled as the Cruze Limited, and the current 2016 Chevrolet Cruze is listed as “all-new” to prevent confusion. What’s new about the 2016 Cruze? A lot, but you might not think that when you first look at it. After comparing the two models, it becomes quite obvious that the design has taken an entirely different approach on the inside and out. The 1.4-liter turbo engine is no longer optional, but comes standard on the all-new Cruze. When you step back and take a look, there is actually a lot that’s changed, putting the all-new in the current Cruze title. Thankfully, each new bell and whistle sounds all for the better. Sporting its new design, the Cruze is bound to be the center of attention – and it is proving to be, and rightly so. The design of the previous Cruze was nice, but it lacked that eye-catching factor that this design has. Chevrolet’s pursuit in making the new Cruze even more aerodynamic has given way to the design you see now, which is sleek, defined, and an all around very handsome exterior. The front end and hood have much more aesthetic appeal than the last iteration of the Cruze. Now, both the front and hood are sculpted to be much sleeker and more aerodynamic. The headlights wrap-around backwards even further, giving the overall initial look a much more aggressive edge. The chiseled perimeter of the hood and defining line that runs along the Cruze, from the front to the back, providing a focal point, are even more pronounced than ever before. As a result of this sleeker style, the headlights and grille also became smaller and longer. They aren’t nearly as bulky and rectangular as the earlier versions of the headlights and grille. All of these elements come together for a forward facing design that looks like an aerodynamic wedge targeted with precision at high-speeds. Overall, this Cruze is much sportier than it’s predecessor. But, the front fascia redesign is just the start of the Cruze’s aesthetic overhaul. The rest of it has a much more defined appearance, with hard character lines running down the sides for some extra attitude and aerodynamic enhancements. Over the wheels, the fenders are more pronounced and sharpened for purely aesthetic purposes. In the back, the new 2016 Cruze has seen the same treatment as the front – resulting in a trimmed and toned makeover. A significant change are the tail lights, which are (just like the headlights) much sleeker than before. They also stretch towards the front even more than last time, and the entire back has been redesigned for a more rounded, less squared off shape. This new sleek attitude is much more appealing than the bulky nature inherent in the last model. While the previous 2016 Cruze design wasn’t bad, it’s a huge difference when you compare the two, especially side by side. From an engineering standpoint, the Cruze has also managed to shed about 200 pounds. This makes the 1.4-liter turbocharged engine even more effective than when it equips the Limited trim, and promotes better performance compared to the Limited’s standard 1.8-liter engine. 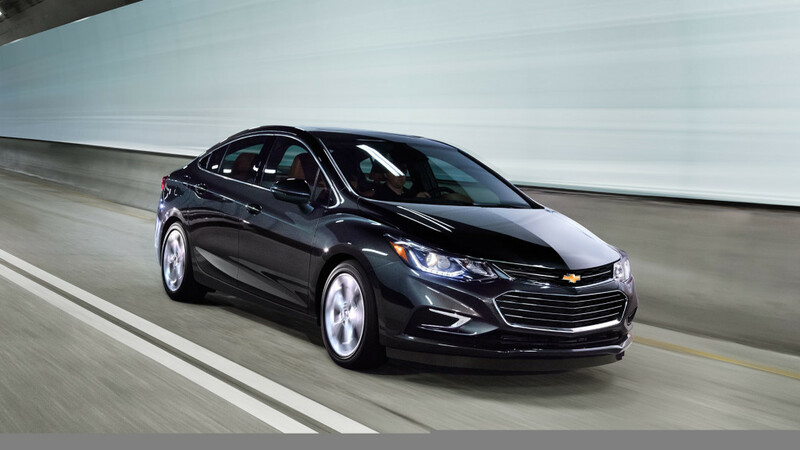 With the new Cruze shedding 200 pounds, and an engine with turbocharging technology that gets better fuel economy, you might wonder why Chevy even offers the 1.8-liter engine? Chevy must have asked themselves the same question, because the 1.8-liter isn’t available on the new Cruze. The all-new 2016 Cruze only comes with one engine option, which is the 1.4-liter four-cylinder turbocharged engine. This engine is rated at 153 horsepower and 177 lb-ft of torque, which are some pretty good numbers for an already small car that has now become even lighter. This engine is paired to a standard six-speed manual transmission across the L, LS, and LT trim levels, while a six-speed automatic transmission is optional — but on the Premier trim level, the six-speed automatic is standard. Opting for the automatic transmission also lands you a stop-start engine feature, which helps save fuel when the car isn’t running. As far as fuel-efficiency goes, the Cruze paired with an automatic transmission is able to get 30 mpg city, and 42 mpg highway, one of the best fuel economy ratings for a compact car. Even when equipped with the manual transmission, the Cruze is still able to get 29 mpg city and 41 mpg highway. As you can see, there is really no need for another engine option. The turbocharged technology ensures that the Cruze has plenty of pep when you hit the gas pedal, and the stellar fuel economy makes most other vehicles on the market jealous. The outside wasn’t the only aspect of the Cruze that received some upgrades, and the inside is even more inviting than before. Now, features like a heated steering wheel, coupled with front and rear heated seats are available, and prove to be a welcomed addition. The material quality is also significantly better, and with this upgrade and the additional features now standard, the Cruze’s interior lands right on par with the other compact cars on the market. A notable upgrade is the MyLink infotainment system. A 7-inch touchscreen comes standard (and an 8-inch is optional), which both retain their easy to use interface and button designs. While the touchscreen interface remains similar, how it operates has benefited from a few upgrades. 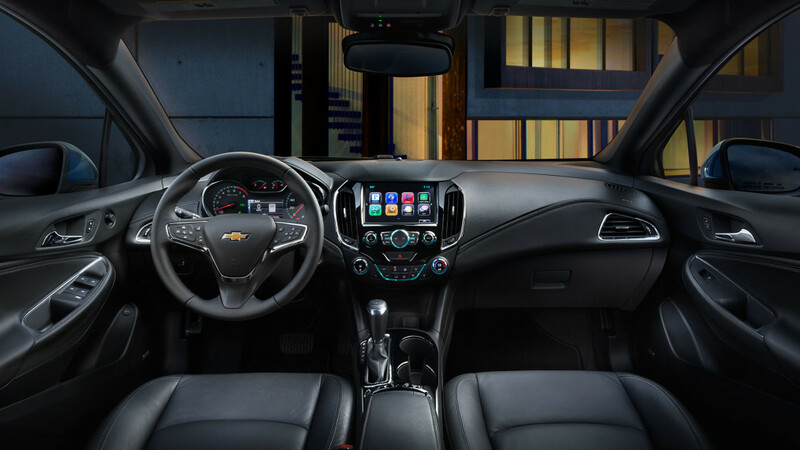 The all-new 2016 Cruze came out after the MyLink system was upgraded, which now boasts faster response times, and the introduction of Apple CarPlay guarantees that both iPhone and Android users will have fully immersive integration with their smart phones. Thanks to the upgrade in design materials, new dashboard design, and the upgrade and additions of the extra amenities, the 2016 Cruze will feel like you are sitting in a whole new car. Rounding everything off, the all-new 2016 Cruze still comes in at an insanely low price, with a starting MSRP of $16,620. That price gets you the same great type of Cruze experience, just with upgrades. Like a sharper and more defined exterior, upgraded interior features, and even stronger and more efficient performance than before. Chevrolet was able to successfully take everything that buyers loved about the Cruze, and improve on it. This redesign was also their chance to take anything they felt was lacking, and step it up as well. Because of this, you can expect the new Cruze will be a very competitive sedan on the market.